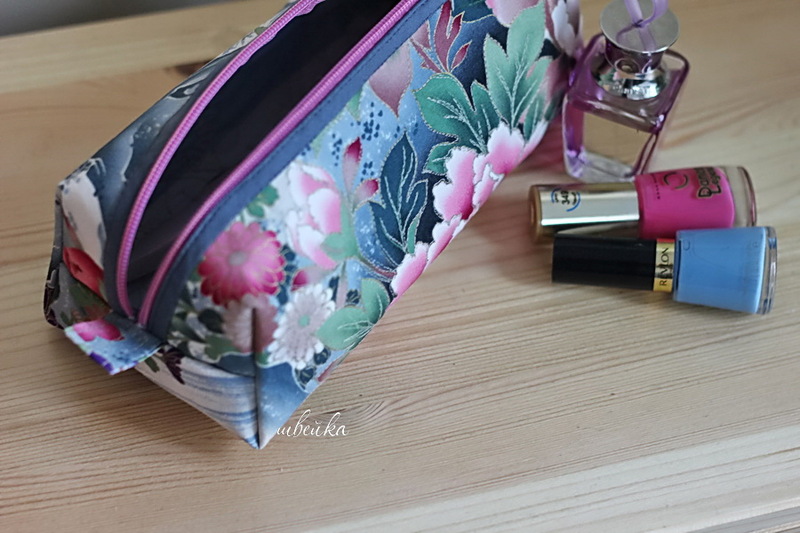 Simple Boxy Pouch Tutorial ~ DIY Tutorial Ideas! 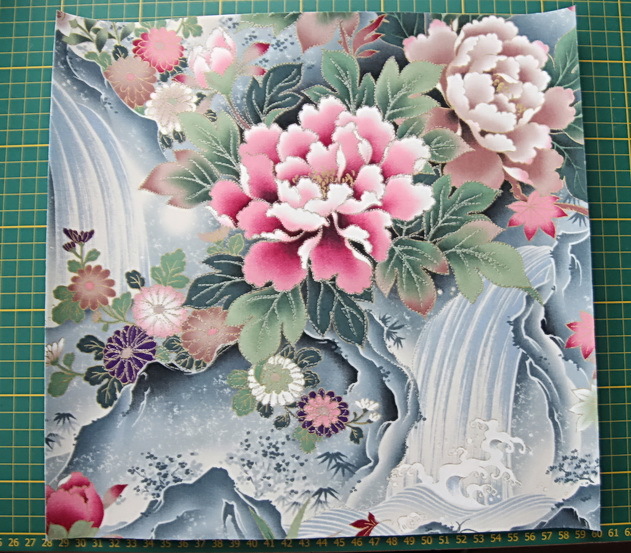 We find an interesting fabric for us about 30 * 30 cm in size. This is a very approximate size, it is possible more - less. The same amount of fabric for the back of the bag, the same - the pads. At this stage, the main thing is to make the bag blank as rigid as possible. 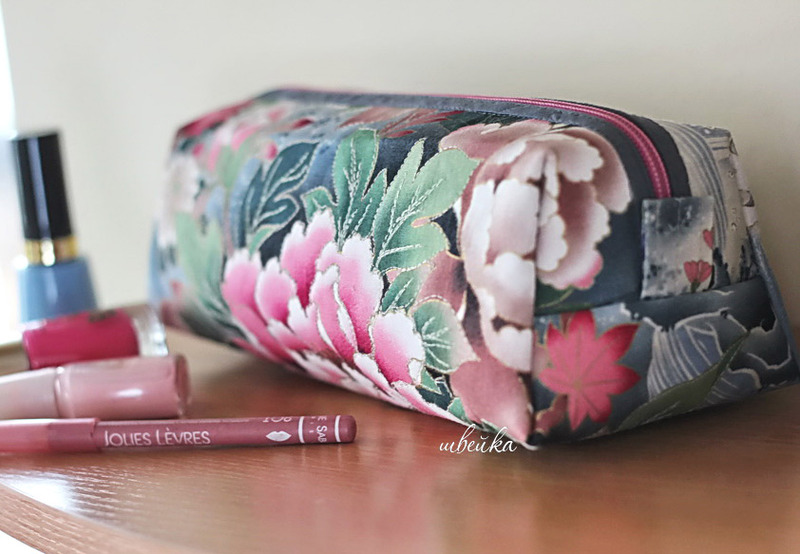 The bag must keep its shape, it is not a soft drape cosmetic bag. Therefore, everything is suitable for strengthening. 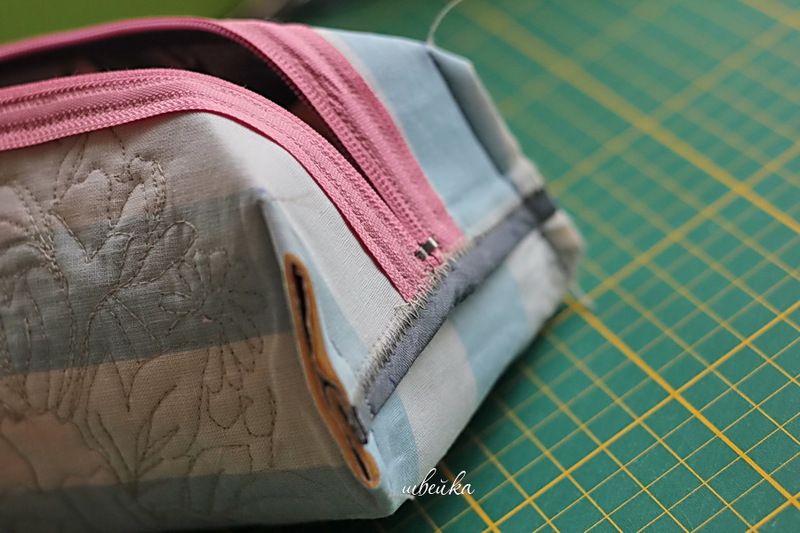 I strengthened the top with a very tough glue, plus I went through a free stitch on the pattern (quilting), connecting the upper fabric, the gasket (viscose hard napkin) and the fabric for the inside of the cosmetic bag. 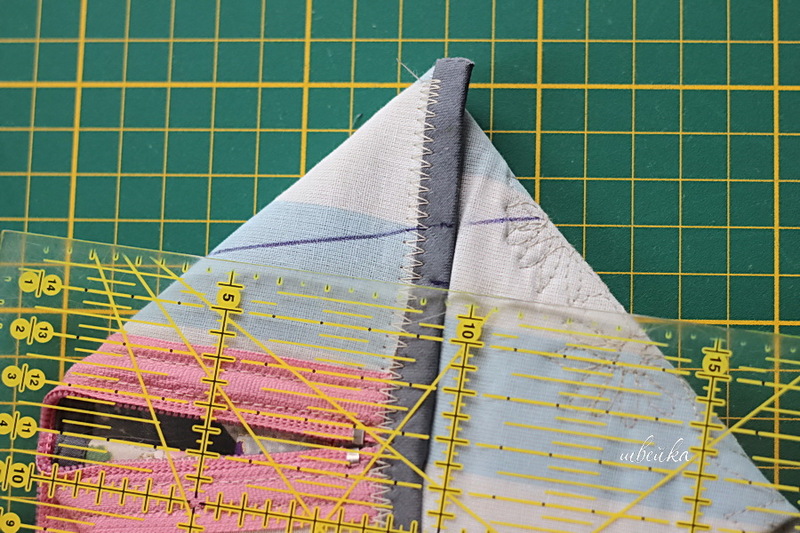 Align the two sides and process the two bias binding. We sew a zipper. 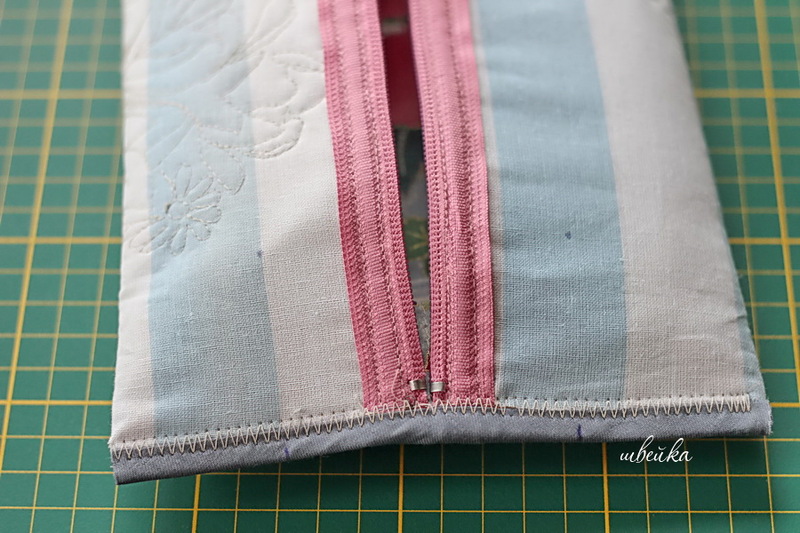 It is always easier to sew a zipper when it is long. It is better to cut off the excess. Zip fastener sew two seams: at the very edge of the bias binding and stepping back from the edge on the width of the foot. So the zipper tape will press well and will not stick out the edges. 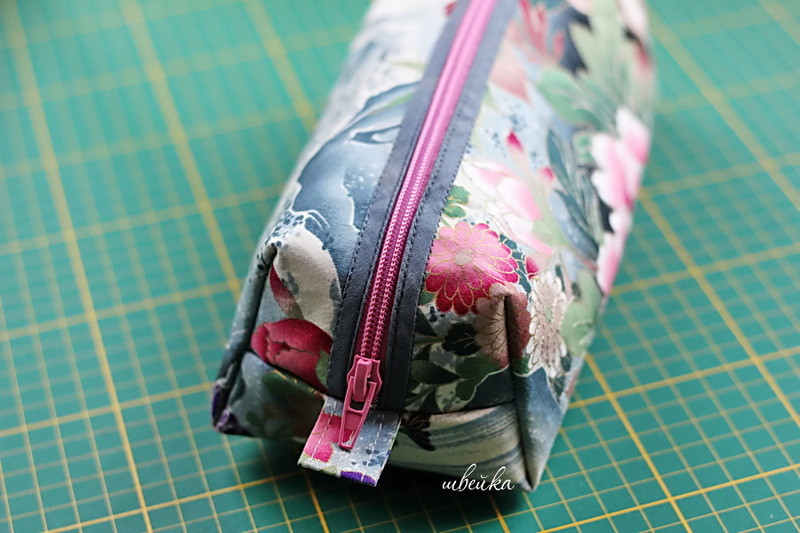 Sew on the zipper conveniently with special legs for zippers. 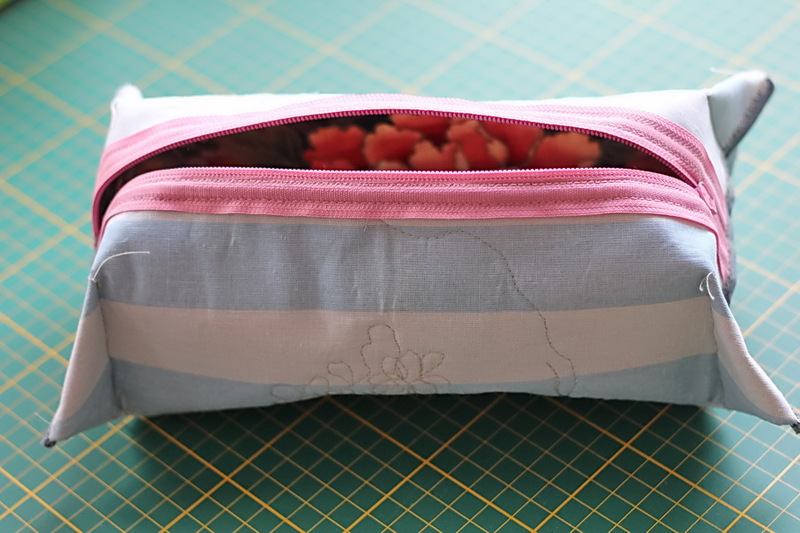 Now we fold the cosmetic bag from the inside out so that the zipper is in the middle. 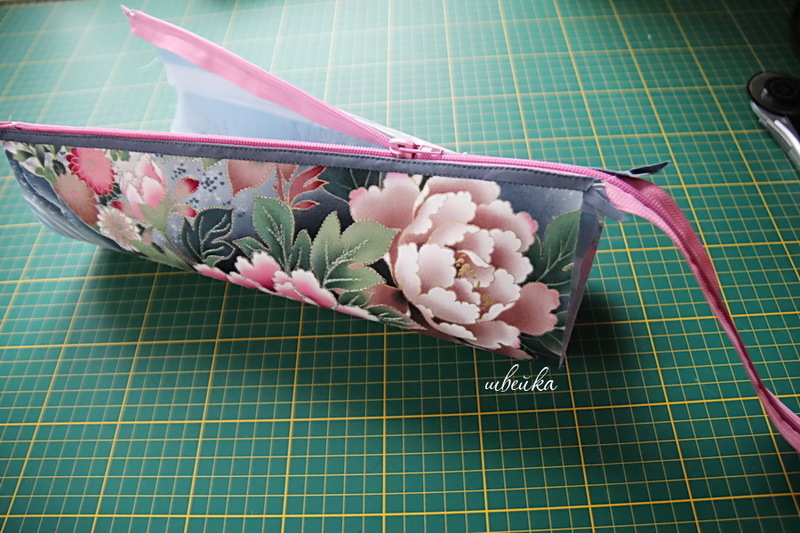 One more thing for this form of cosmetic bag - need cloth tongues, for which it will be possible to hold it during opening - closing the zipper. Need to sew blanks for them. For example, small strips of fabric, several times stitched in length. We insert them under the zipper. We are stitching. 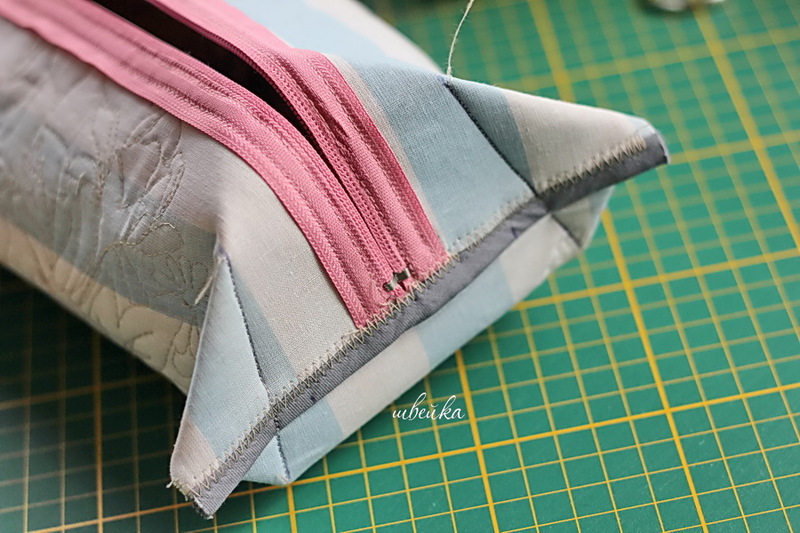 We open the open sections of the bag - it can be bias binding, it can be overclocked, it can be zigzag more often. From the edges of the retreat 5 cm, make a mark. We retreat from the mark up -6 cm. Put a point. 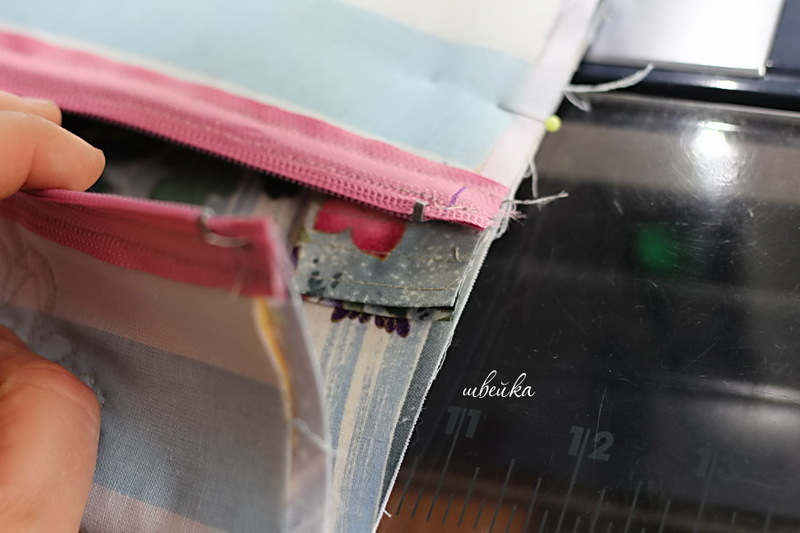 At this stage, you can always make your own proportions - for example, put the label up higher, then the cosmetic bag will be higher, but shorter. Now bend the bag at an angle. The ruler is set perpendicular to the seam. We subtract 1 cm from the mark on the seam (here you can also vary. 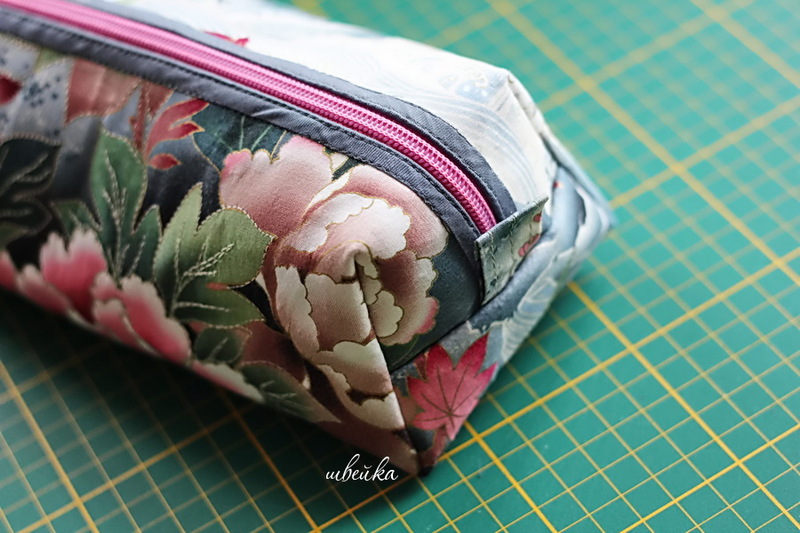 If you put more than 1 cm, then the bottom of the cosmetic bag will be very wide and the top will be narrow.) And we will draw a line through the new tag. This will be the seam line. We are stitching. We do this simple operation on all corners. And now the forms of that bag are already visible. And this is without any patterns! 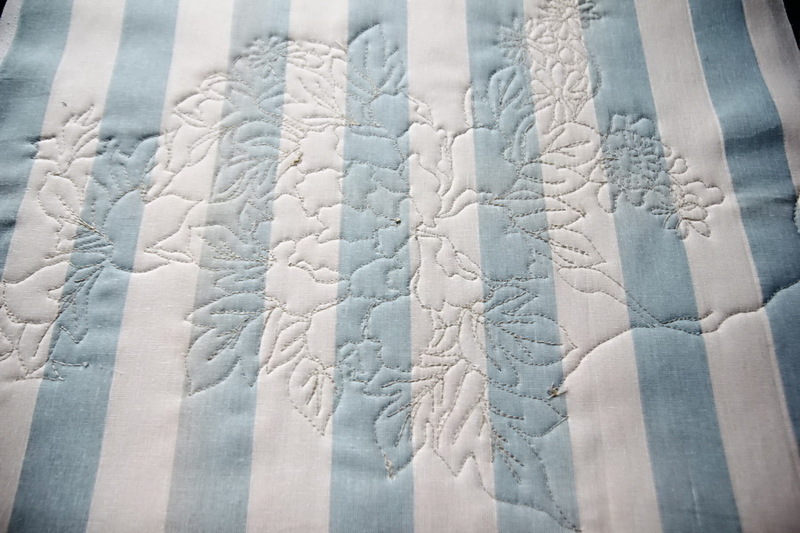 Now it remains for small - we cut off excess fabric at the seams, process and turn it out. Thank you! Very easy and versatile.